Long ago, a nebula used to refer to any astronomical object that is found in the sky. An example of this would be the Andromeda Galaxy which used to be referred to as the Andromeda Nebula. Now, a nebula is an astronomical object referring to an interstellar cloud of dust and gasses. The two most famous nebulae are the Crab Nebula and the Pillars of Creation. 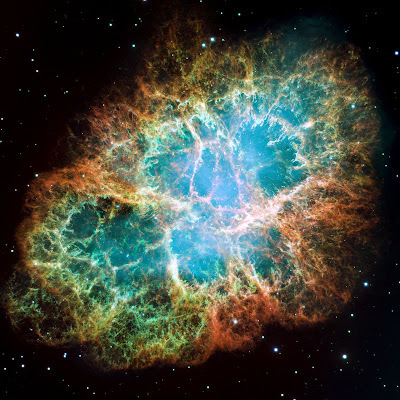 The crab nebula is a six light year wide nebula formed during a supernova. Nebulae are regions, such as the Pillars of Creation, where astronomers believe stars are formed. These clouds of gas and dust start to form large masses that eventually become stars as these start to grow bigger in size. To a lesser extent, even planets and other objects are also believed to be formed within these regions. Nebulae are separated into four general groups, Diffuse nebulae, planetary nebulae, protoplanetary nebulae, and a supernova remnant. 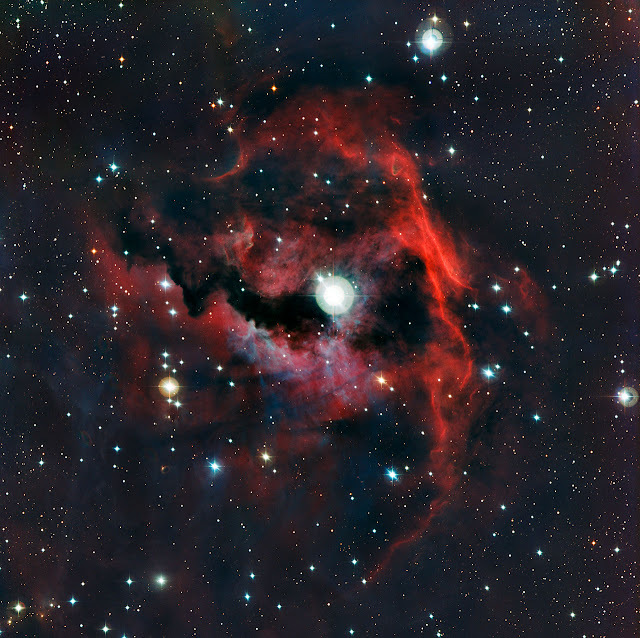 A diffuse nebulae is low density cloud formed when a star was produced. 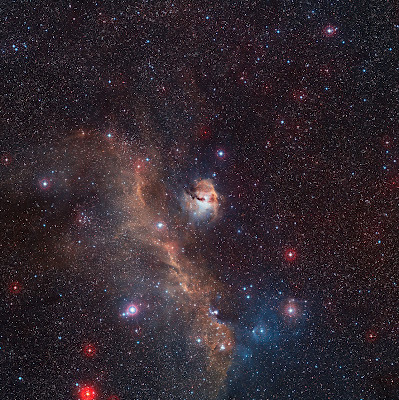 A planterary nebula is a cloud of gas formed when a mature star starts ejecting ionized gas. A protoplanetary nebula is a mid stage where gas starts to escape the star before a star starts to eject gasses to form a planetary nebula. A supernova remnant is a special kind of diffuse nebula where the cloud is formed when a star explodes. The radiation from the young stars causes the surrounding hydrogen gas to glow with a rich red colour and become an HII region . Light from the hot blue-white stars is also scattered off the tiny dust particles in the nebula to create a contrasting blue haze in some parts of the picture. By chance this nebula lies close in the sky to the Thor’s Helmet Nebula (NGC 2359), which was the winner of ESO’s recent Choose what the VLT Observes contest. This nebula, with its distinctive shape and unusual name, was picked as the first ever object selected by members of the public to be observed by ESO’s Very Large Telescope. These observations are going to be part of the celebrations on the day of ESO’s 50th anniversary, 5 October 2012. The observations will be streamed live from the VLT on Paranal. Stay tuned! Brigitte Bailleul and Thor’s Helmet — Winners of ESO’s 50th Anniversary Competitions!